It all started when I was trying to think of a cheap family event. We went on a hike after seeing a friend post some cool pics on Facebook. Coming from California, Mr. Wonderful and I were convinced that the best scenic spots in the U.S. we're being held hostage on the west coast. Ok, so we were wrong. On this gorgeous riverside hike which by the way, thanks to my All Trails app, we ended up cliff diving with an infant, a toddler, and a 10 week old goldendoodle-- yea... fun... We noticed all of these fisherman. I've always wanted to connect with the cave woman Jane in me, so when we got home I ran out to our shed. I knew it! 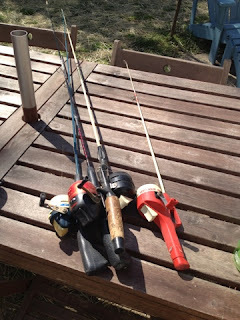 There were 4 discarded fishing poles that my in laws had left when they unloaded Mr. Wonderful on me. We pulled those babies out, cleaned them, lined them and hooked them. 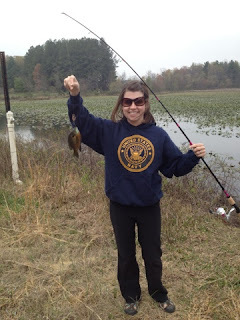 Then we went and got our fishing licenses and bait. We grabbed this stuff in colorful packaging that guarantees fish. Having not fished since I was 5, I put my trust into Mr. Wonderful after hearing about all of his "fishing adventures"... Turns out he's been falling asleep at the pole. We're the blind leading the blind here! 4 disastrous fishing trips later, I'm ready to give up. 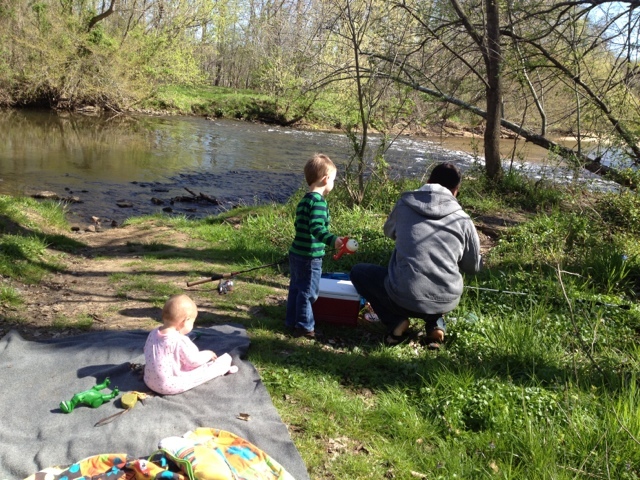 Our lines are getting caught on everything, The Wild Thing keeps throwing rocks in the water, Twinkle Toes rolled down a hill and almost into the water and of course we hadn't caught any fish. Not even a bite. We decided that our first issue was the flippin' poles. They were 20 years old, and had way outlived there former glory days. My in laws, excited that we had found a fun family hobby, jumped at the opportunity to get us new poles. Once we got our fancy poles, we just needed some direction. I signed up for a free fishing class down at Bass Pro Shops and did all of the Internet research I could... As for the bait we've been using, I don't know how "power bait" can call themselves that because we had a 0/4 success rate here. Screw 'em. I got out our shovel, grabbed The Wild Thing and headed out back in search of worms. We found about 10 of those wiggly suckers, stuck them in a coffee can and packed up the car. I'm the spoiled one in the family, so as soon as we parked, I handed off the work to Mr. Wonderful and sunk my line as fast as I could... Tug... Tug... Could this be a fish? Reeled in... *GASP! * My worm was gone! Mr. Wonderful, "You didn't set the barb?". Oh, NOW the wise one speaks. I'm mumbling under my breath cursing the damn fish that stole my worm. I worked hard for that worm! Threw the line in again... Tug... Tug... I whip the pole back to "set the barb"... Reel it in. Nothing... My worm is still intact though. Me, "I had one, I swear, I did! That little sucker is messing with me!". "You have to let them nibble a bit first. ", the wise one speaks again. Um... Hello? Where were you last week? Thanks. - Mind you, only minutes have passed here and Mr. Wonderful has just finished unloading the kids and he's now baiting his hook. I throw the line in again, I'm mumbling much louder now, damn fish isn't going to make an fool out of me! Tug... Tug... Wait... Tug... Tug... Snapped the pole back, and reeled that sucker in. My first fish! I'll never forget the face on Wonderful... It was that "son of a --, she caught one and I'm still standing here worming my stupid hook" face. I like to revision that face still, it warms my heart <3. We caught 8 that day. I still can't tell you exactly what kind they were but they were yummy. *For the record, I caught the most that day. * Day 2, still high off our thrill ride, we learned you can buy worms. Did I mention we are geniuses here? This time, Wonderful is on a mission to show me up. 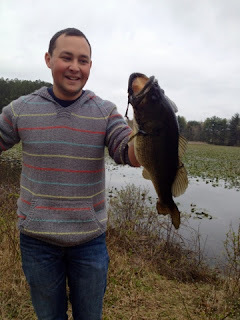 He leaves me with the work and dips his line to pull up a 20" largemouth bass before I can worm my hook. Son of a --!!! Yup, he wins. All in all, we've been having a great time with it. Caught fish 3 days in a row and we're hooked. I even wormed my own hook, yuk!! Day 8 - Done Deal. Day 4 - Check in. Day 2 - 10% Calmer. Day 1 - Guilt and Improvement. Day 0 - Shutting Off.